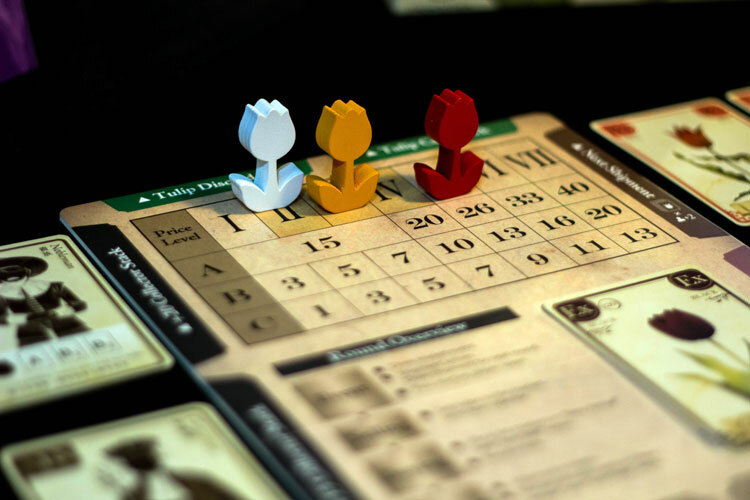 We review the economic and auction board game Tulip Bubble. While I'm not usually a huge fan of auction games, Tulip Bubble actually works some clever mechanics into the game that makes it very enjoyable. 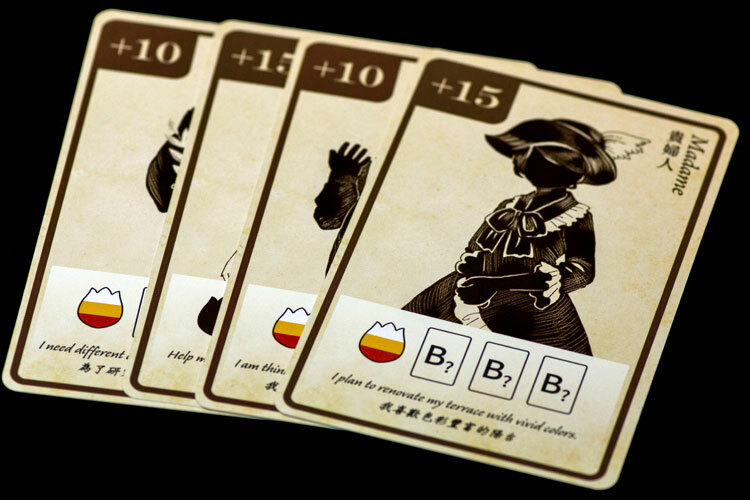 Tulip Bubble is a game about the real life explosion of tulip prices in the Netherlands in the 17th century. 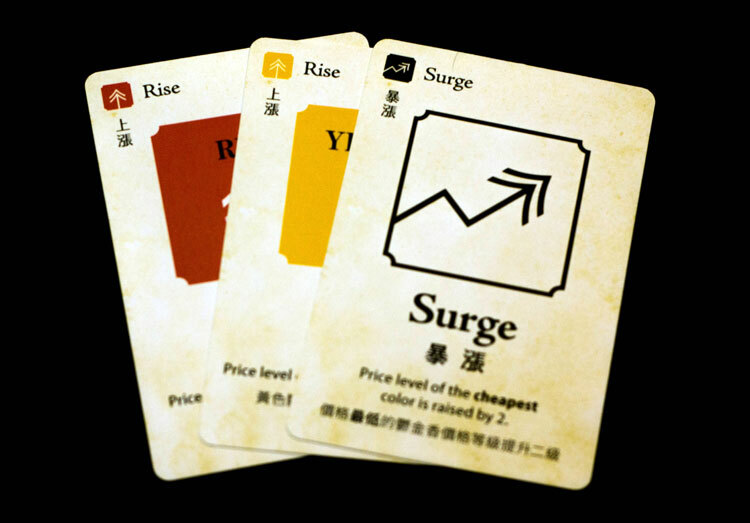 Widely considered to be the first economic speculation bubble, it makes an interesting setting for a quick playing economic board game. Players will bid on beautiful flowers and sell them to try to make a quick buck before the market comes crashing down. 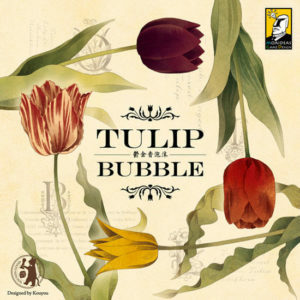 Tulip Bubble is an auction and set collection game plays 3-5 players in about 45 minutes. In Tulip Bubble, players buy tulips in an auction and hope to sell them once the prices increase. 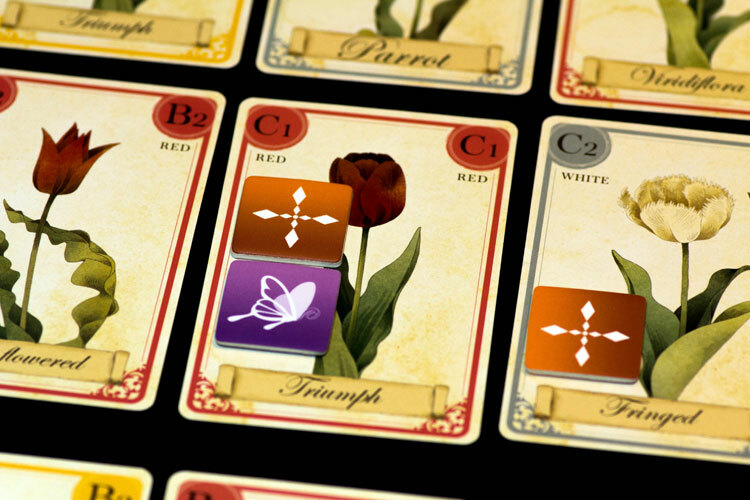 During the buying phase, each player can place three bidding markers on the tulips in the market. If you are the only person who places a marker on a tulip, you can buy it for the market price. However, if multiple players bid on the same tulip an auction occurs. Each player uses bid markers to indicate which tulips they would like to buy. In turn order, players can up the bid until only one player is left and they win the right to purchase the flower. Any money spent over the market price is divided between the players who participated, but lost, the auction. It is an interesting mechanism that makes over bidding even more dangerous as that extra money is going right to your opponents. Most importantly, you don’t actually need to have any money to buy tulips. This is a bubble, after all. You can finance a tulip purchase from the bank. The only downside is that your bid marker stays on that card until you pay it off or sell it. So you’ll have less purchasing power if you get stuck with too many outstanding debts. After the buying phase, the market shifts based on the tulips remaining and the tulips coming in the next shipment. Whichever color has the most tulips available will go down and the scarcest color will go up. Collectors will buy sets of tulips for a premium if you can supply exactly what they require. Like any good economic game, not all of the information is known. Before any tulips can be sold, a market event occurs that also impacts the values in the market. Only then can players sell tulips, hopefully for more than they bought them for. There are also collectors available who will pay a premium if you can fill the exact colors and varieties they require. The game can end in two ways. If any player has 120 dollars at the beginning of the buying phase, they can buy the illustrious black tulip and win the game. Alternatively, there is a bubble burst card shuffled into the last three cards of the market event deck. When that is revealed all tulips are immediately worthless and whoever has the most money is the winner. Tulip meeples show the value for each color. Each space can only be occupied by one meeple, so they will jump up and down in value throughout the game. I am, without a doubt, a sucker for economic games. So I was a little bit predisposed to enjoying Tulip Bubble. That said, it has quickly become one of my favorite games of the year. The ability to finance your tulips is center to the game being really enjoyable. The market shift can be fairly predictable, as it’s based upon the cards that are face up on the table. However, the market event represents the unknown and can have disastrous impacts on your best laid plans. Market events will increase or decrease the value of certain colors each round. The game looks great on the table. The tulip cards are beautifully illustrated and the market board is tracked by large wooden tulip meeples. Everything evokes a kind of 17th-century vibe, which certainly helps connect the game with its setting. Each game I have played has felt a little different. In some, the top half of the market event deck was exceptionally kind and we ended the game after about 5 rounds by buying the black tulip. However, the auctioning was a little less cut-throat. As players became more familiar with the game, it is increasingly difficult to get a good deal and those tulips that are on their way up often have that increase already priced in. The risk versus reward element is also evident in the last few rounds. As the bubble bursting can happen in any of the last three rounds, it becomes incredibly more risky to buy into tulips that may be worthless in just a few short moments. While it is sometimes frustrating for the game to be decided on who was willing to gamble on the bubble not yet bursting, it certainly makes a lot of sense with the theme and makes for some really tense moments. If you are a fan of economic games, you should check out Tulip Bubble. It forces you to really balance the risks that you are taking. The bubble bursting aspect adds a lot of tension to the final turns. In general I’m not a huge fan of auction games, but this one feels very different as everyone can see how much each tulip is actually worth and could be worth. It is just a question if you are willing to put your money (or your credit) out there. 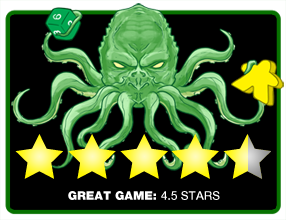 Final Score: 4.5 Stars – One of my favorite economic games of recent times. Auction and market implications make it immensely enjoyable.